Definition at line 28 of file StoreMap.h. Definition at line 31 of file StoreMap.h. Definition at line 33 of file StoreMap.h. Definition at line 34 of file StoreMap.h. Definition at line 46 of file StoreMap.h. 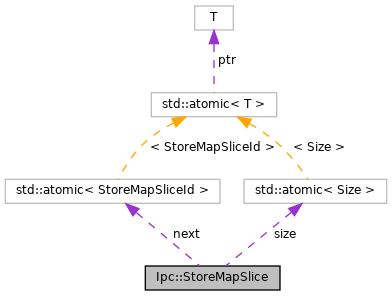 Referenced by Ipc::StoreMap::freeChainAt(), and Ipc::StoreMap::prepFreeSlice(). Definition at line 39 of file StoreMap.h. Definition at line 49 of file StoreMap.h. Referenced by Rock::IoState::callReaderBack(), clear(), Ipc::StoreMap::closeForUpdating(), MemStore::copyFromShm(), Rock::SwapDir::droppedEarlierRequest(), Rock::Rebuild::finalizeOrThrow(), Ipc::StoreMap::freeChainAt(), Rock::SwapDir::handleWriteCompletionSuccess(), Rock::Rebuild::mapSlot(), MemStore::nextAppendableSlice(), operator=(), Rock::IoState::read_(), Ipc::StoreMap::sliceContaining(), and StoreMapSlice(). Definition at line 48 of file StoreMap.h. Referenced by clear(), Ipc::StoreMap::closeForUpdating(), MemStore::copyFromShm(), ShmWriter::copyToShmSlice(), MemStore::copyToShmSlice(), Rock::Rebuild::finalizeOrThrow(), Rock::SwapDir::handleWriteCompletionSuccess(), Rock::Rebuild::mapSlot(), MemStore::nextAppendableSlice(), operator=(), Rock::IoState::read_(), Ipc::StoreMap::sliceContaining(), StoreMapSlice(), and MemStore::updateHeadersOrThrow().